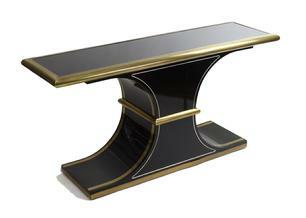 This hour glass shaped console table was designed in the early 1980’s by long time Mastercraft designer William Dozema. The table is finished all the way around. The brass trim to the top shows the original hand brushed patina, bringing a beautifully antiqued contrast to the overall modernist design. The table is in excellent original condition. The black lacquer shows no marks whatsoever on the table sides, and only the most minimal usage marks on the top, as though a runner had been used to protect the finish.